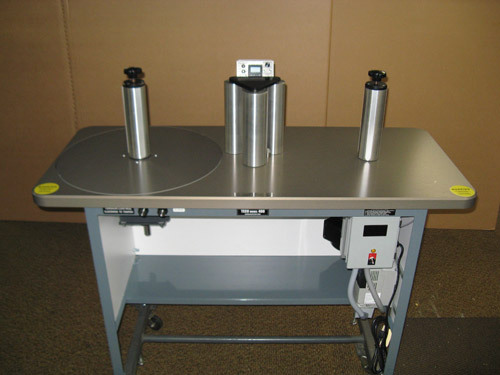 Model 400 is a large capacity, heavy duty rewind table designed for the converter or label manufacturer handling rolls up to 24" diameter, 10" web width and weighing up to 95 lbs. max. This machine is provided with rotating bearing pads at the unwind and rewind stations. 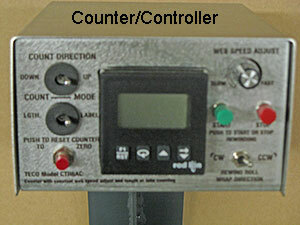 The Model 400 uses a 2 HP AC motor and speed control. It is provided with heavier bearings and drive shaft as well as heavier unwind and rewind shafts. Core holders and idler spindles are designed for for 10" web. In addition to its heavier design it has all the features of the Model 300. 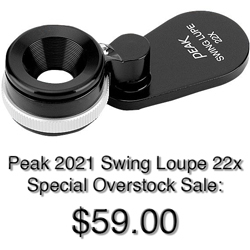 The Model 400 comes complete with two 3" wedge lock core holders and manual.